Coconut Mall is the second course of the Flower Cup in Mario Kart Wii. 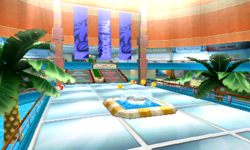 It is set in a shopping center, located on Isle Delfino (according to the Official Mario Kart Wii Game Guide published by Prima), but clearly next to a beach. The race takes place in a mall set in a beach setting. The first parts of this course are very straight, but it starts with two escalators going in opposite directions, and every fifty seconds they change directions. The Pianta nearby will point to the escalator the player would want to go through, which is in this case, upwards. After that, the player may choose to go through three paths. One of them descends into a lower level via an escalator that always goes downwards while the other two stay on the current level. After the first turn, there is a fountain and another set of escalators, much like the beginning of the race. The player then needs to go up a passageway into another room with more fountains and some boost pads. After that, there is another room and a turn to the exit of the mall and into the parking lot. Cars with the player's Miis driving them will move back and forth in the parking lot, which the player must avoid. If players hit these then they will be knocked back. After a final right turn the player will cross the start/finish line, starting another lap. The race starts in the entrance of the mall, near the parking lot. There are stairs that lead up to two escalators, which go in opposite directions. A Pianta stands between the two and will point at the one moving upwards. After that, residing in an upper level of the mall, the player will have a choice to stay on the upper floor or to descend onto a lower floor via escalator. If the player chooses to stay on the upper level, they can go either left or right of the escalator leading downstairs with the left side having two boost panels. Afterwards, they will then meet up either via a stunt from the upper level, going down another escalator that leads to the lower level, or from driving from the lower level. There is a fountain there that the player can perform stunts on. After the fountain are two more escalators, and once again a Pianta will point in the correct direction. After another turn in a metal passageway, the player reaches another room with more stores. There are palm trees with bumps which the player can do a stunt in, another fountain, and boost panels left and right of this room. Item boxes are found at the top of the fountain and bumps, and if the player drives on top of them at full speed, he or she may receive an item. Tables with umbrellas, palm trees, and the mall's pillars may serve as static obstacles, which the player may bump into and lose their speed. There is another metal passageway that leads upward to the right into a smaller room. Here, there is a store that sells Mario items such as a Green Mushroom Burger or Star Juice and is called "Coco Burger". There are two paths the player can then take. One is to the right with a boost panel before it, leading into another metal passageway, going up and to the right into a giant, glass ramp. Two boost panels reside in the giant ramp and the second takes the player out of the mall and into the parking lot, falling from a distance, allowing the player to do a stunt before dropping down. The other passageway leads into a room, which turns right. There is another bump and a palm tree with some item boxes around. There is a flat boost panel that the player can still do a stunt on and the player will end up in the same area as the latter route. In the parking lot, there are two metal ramps for the player to perform a stunt and receive items from an Item Box. After a 90 degree turn right, three cars driven by player's Miis will move back and forth, making them appear that they are trying to park. Boost panels are there right before the cars, making it difficult to hit them because a car may be just right in front of the boost panels. If the player happens to get hit by it, he or she will flip over and lose any items he or she has at the moment. A Super Star, a Mega Mushroom, or a Bullet Bill will knock the cars aside without any effect. After the last right turn after the cars is the finish line. In this track, the staff ghost is Daisy. She rides the Sugarscoot for the Normal Staff Ghost, while the Expert one is her in the Wild Wing. There are two shortcuts; the first requires a Mushroom, Mega Mushroom, Golden Mushroom, or a star. After going up the first escalator, the player must head to the right, staying near the glass windows with Miis behind them. After a very short distance, players should see an opening in the glass wall, they can go through this opening, and use a Mushroom or Golden Mushroom to boost over the carpet. They'll then exit the store after the Mushroom and drop back to the main course. However, if the player veers right instead of dropping back onto the main course, there will be a longer off-road section that will lead the player past the second set of escalators. Doing this, however, requires either three Mushrooms or a Golden Mushroom. On a side note, vehicles with high off-road stats can handle this shortcut and the extension without a Mushroom boost. The second shortcut is near the exit of the mall before the parking lot, instead of going straight onto the metal passageway, the player must turn right and go through a short tunnel until they enter a sunroom with a palm tree containing item boxes. The player will soon jump off of a boost ramp and land in the parking lot. The AI or CPU can also be seen taking this shortcut. This course has a glitch that can by accessed by hitting the intersection point of 2 rails near the first fountain, which can be done multiple ways. Hitting this point will knock the player out of the course's boundaries without Lakitu rescuing them. While the out-of-bounds that can be explored is large, it can be used as a shortcut by driving through the parking lot to the right of the finish line. By hitting an invisible wall when entering the parking lot in a way that knocks them to left and driving through the car at the far end of the parking lot and returning to the finish line. The first tournament of July 2008 took place at Coconut Mall. Players had to collect all fifty coins in the fastest time possible. This tournament was later repeated as July 2010's first tournament, December 2011's second tournament, and March 2013's first tournament. Coconut Mall in Mario Kart 7. This track reappears in Mario Kart 7 as the third race in the Banana Cup. There are many changes that have been made to the course, mostly due to technical limitations of the Nintendo 3DS, but only a few of these actually affect the gameplay. There are no longer Miis and Piantas on the inaccessible platforms. The advertisements containing images of player's Miis have been removed. Both jumps that lead out of the mall and into the parking lot incorporate a gliding section. Some Item Boxes have been replaced with coins. The shortcut in the "Delfino Dream" shop no longer requires a Mushroom to use. There are colored arrows on the escalators to show the racers which direction they are moving instead of the Pianta pointing at the right way. Only two of the Mii-driven cars are present, making it easier to hit the last boost panel. All cars now drive back and forth the whole width of the track. In the Wii version, two of the three cars drove only half of the width. "Multiple paths, wide-open spaces, and moving escalators. Darting cars in the parking lot and lead to major road rage." "A trip to the shops was never this much fun! Whether you're driving up escalators, taking shortcuts through shops or avoiding Miis in the car park, Coconut Mall has everything under one root." The area before the second set of escalators that lead upwards. The room with fountains, palm trees, and boost panels. The second set of escalators at a different angle. The stairway after the second set of escalators. Players can choose which path to take to exit the mall. The July 1, 2008 tournament. The courtyard inside the mall. The gliding section after exiting the mall. The parking lot outside the mall. Among the things to buy to eat are Mushrooms (Red and Green), Fire Flowers, Bananas, and Super Stars. The advertisements are filled with the player's Miis. On top of that, most customers in the mall are also the player's Miis. However, if the player has no Miis, CPU Miis from the Wii series will be on advertisements. In the Mario Kart 7 version, the track is considerably shorter in length than that of the original Wii version. This is one of the few retro courses in Mario Kart 7 to display advertisements in the same places as the original course. Other examples include GCN Dino Dino Jungle and N64 Luigi Raceway. Since Mario & Sonic at the Olympic Winter Games, Coconut Mall's music has appeared in the Mario & Sonic series as a selectable song when participating in events. The directory signs say "toilets" and "lift," British-oriented terms for "restrooms" and "elevator." This is present in the American version as well. This page was last edited on March 18, 2019, at 19:40.